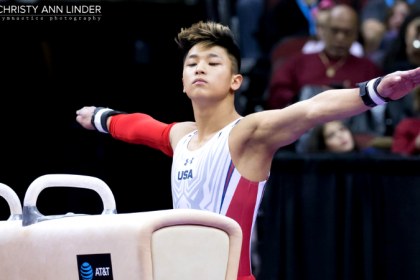 It was a crazy and hectic three-day competition for regionals, and after it all, we know our eight teams, four all arounders and 15* individual event specialists that will compete for national titles in Fort Worth in two weeks. Each week, we’re also dishing out a few superlatives for some of our favorite moments, looks and results from the weekend of competition. Below those, you’ll find your typical results and highlights from every regional competition. *Trinity Thomas qualified on both bars and beam, making the total 15 rather than 16. Boren, a senior for the Gators, is one of the best all arounders to have competed in orange and blue. Despite her moment of weakness where she suffered a fall on beam that contributed to Florida missing qualifying for the nationals championships—but was not the only reason—Boren will still get to wrap up her career on a high note as an individual all around qualifier to Fort Worth. As most people have heard at this point, Cerio’s gymnastics career didn’t end the way she might have hoped, suffering a gruesome injury on floor. The senior has been a standout for the Tigers during her time at Auburn. Plus, to add salt in the wound, she’s scheduled to get married in just a few weeks. Everyone here at College Gym News wishes Cerio the best and for a full recovery as she continues on as an aerospace engineer at Boeing in Seattle. After having an up-and-down season on both of her two events, Oakley hit when it counted, notching her first career perfect 10 and Georgia’s first on bars since current head coach Courtney Kupets Carter in 2009. Kyla Ross and Taylor Houchin both performed stellar Yurchenko one-and-a-halfs in round two in Ann Arbor. Ross, rightfully, scored a 10.0, while Houchin’s came in a 9.975. You be the judge: Where did a judge find 0.05? The Big Storyline: All four teams in round three came to play, going 24 for 24 and scoring season or program bests. Unsurprisingly, Oklahoma claimed the top spot after a fairly stellar day all around. The Sooners’ only major errors were vault landings throughout the lineup, which is something they will likely focus in on heading into nationals. The real story here was the fight for second. Georgia and California looked like the most likely candidates after a lackluster start for Kentucky that was riddled with small bobbles and steps on its first two events. However, the Wildcats picked up steam on floor, bringing the three teams vying for second within four tenths heading into the last rotation. Though Georgia ended on a tough event—beam—a solid and steady performance allowed it to claim the second spot after Cal had to replace Maya Bordas in the lineup and ended up struggling with some landings on floor. Individual Insights: Two of Kentucky’s pivotal seniors, Alex Hyland and Sidney Dukes will finish their senior seasons at nationals after being part of last year’s team that made the program’s first national appearance as a team. This regional also sees two exciting freshmen advance in Milan Clausi and Cally Nixon. Brooke Kelly’s 9.875 on beam was one of three 9.875s after taking out qualifying teams—she wins the tie break to advance to nationals. Grace Woolfolk and Chelsea Shu, the other two who notched that score, are ultimately left out of the qualifying field. Don’t Forget Us: In round two, play-in winner N.C. State exceeded expectations and finished ahead of higher-ranked Maryland. Missouri put up a fight to Kentucky in round two, finishing just 0.225 out of the second regional final qualifying spot that was ultimately claimed by Kentucky. Iowa State put up a solid number as well, posting its fourth 196-plus score of the season. Meaghan Sievers and Grace Woolfolk on floor and beam, respectively, were highlights for the Cyclones, but both will miss nationals due to tie-breaks. North Carolina’s Khazia Hislop didn’t disappoint with two 9.875s on vault and floor and notched a 9.800 on beam to go 9.800-plus on each of her events. Rutgers’ Belle Huang dazzled on floor for a 9.900 but also will not advance due to tie-breaks. Records: Both Cal and Kentucky set program records in round three. Cal topped the record the Bears set earlier this season with a 197.675 and Kentucky scored a 197.600 for its new team-best. Marissa Oakley scored Georgia’s first Perfect 10 on bars since current head coach Courtney Kupets Carter did it back in 2009. Oklahoma’s 198.475 from round three was the highest NCAA road score in history. Controversies: Cally Nixon will advance to nationals on bars, winning the tie-break over Morgan Porter because she has the higher NQS. Brooke Kelly and Sidney Dukes also advance on tie-break rules. What’s Next: Oklahoma and Georgia will compete in semifinal two. Oklahoma will start on vault while Georgia will start on bars. They will compete against Oregon State and Denver, and the top two teams will advance to the finals. The Big Storyline: The fight for the two advancing spots was intense. UCLA started the day with a fall on beam from Grace Glenn in the leadoff spot but would have no more major mistakes. However, from the moment Grace Glenn missed, it was clear this would be an eventful four rotations. Michigan suffered from a case of the steps on bars, and Alabama’s incredible 49.425 floor rotation had it in first after one. On the heels of a strong comeback on beam, Michigan pulled ahead of Alabama after two, by only 0.125. Nebraska, which started well on vault, lost some momentum in the second rotation after a fall took some of the air out of the team’s energy. In the final rotation, Michigan finished vaulting with its 197.275 secured. Lexi Graber put up a stellar beam set, but it wasn’t enough and Michigan came away with the second qualifying spot by just 0.050. Individual Insights: Denelle Pedrick had an excellent day during round two, finishing third overall. Had Michigan and Nebraska advanced, she would be going to nationals. Mary Elle Arduino was stellar on beam with a 9.900, and only doesn’t advance due to tie break rules. Don’t Forget Us: Central Michigan and Illinois put up a good fight in round one; Illinois advanced to round two and finished third in its session above higher-ranked West Virginia. The Mountaineers suffered a tough blow when freshman standout Rachel Hornung was injured during rotation two touch. Penn State had a good showing in its round two outing. Records: This is only the second time since the NCAA added women’s gymnastics that Alabama will miss the big dance. Controversies: Abby Armbrecht is one of four non-advancing individuals who scored a 9.900 on floor. She advances on tie-break rules, after counting all four judges’ scores. Jessie Bastardi also advances on a tie-break, as does Sabrina Garcia. On bars, Sienna Crouse had the highest score of a non-advancing individual, but since she advances as an all arounder, she is taken out of individual event qualification. What’s Next: Michigan will land in semifinal one, starting on bars; UCLA will also be in session one, starting on vault. They will compete against LSU and Utah for the two spots that will qualify for the final. The Big Storyline: LSU prevailed despite an improbable series of illnesses and minor injuries to stars like Sarah Finnegan, McKenna Kelley and Lexie Priessman. Utah cut things a little closer, staying within a few tenths of a surging Minnesota for most of the round three meet. The Utes’ shaky weekend included a first-ever career fall from junior MyKayla Skinner. Minnesota fought hard, but a few stumbles on floor in the third rotation left it with too much ground to make up on vault, its weakest event. Auburn had a spectacular meet in round two despite a devastating injury to senior Samantha Cerio, but unsurprisingly seemed a little unfocused on the final day of competition and was never really in contention. 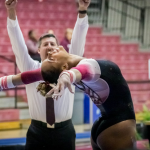 Individual Insights: Cairo Leonard-Baker of Arizona State was the only individual to confirm her spot at nationals after round two, winning bars outright on Friday and putting herself out of reach of the qualifying teams. Minnesota’s Ona Loper missed out on nationals due to a tiebreak on vault where she and qualifier Derrian Gobourne both scored 9.950. Abby Milliet also equalled the qualifying score on beam but missed out. Don’t Forget Us: Lindenwood came up just short in round one versus George Washington but should be incredibly proud of its performance at its first-ever regional. Arkansas put the pressure on Minnesota in session one, but the Gophers were ultimately able to punch their ticket to the regional final. Records: This was Lindenwood’s first appearance at NCAA regionals. Mykayla Skinner’s career record of 161 hit routines came to an end after she fell on bars in the regional final. In round two, Ona Loper set a career high on vault with a 9.950. Controversies: Derrian Gobourne advances to nationals on a tiebreak over Ona Loper because her head judge’s score was higher. Hailey Garner also advances on a tiebreak on beam due to her four-judge average being the highest. What’s Next: LSU and Utah will compete in semifinal one at nationals. LSU will start on beam while Utah will start on floor. They will compete against Michigan and UCLA, and the top two will advance to the final. The Big Storyline: Corvallis saved the best for last! It was the only big upset of regionals with Florida not advancing to nationals for the first time since 2000. The Gators started off with a rocky beam rotation in which they had to count a fall when both Megan Skaggs and Alicia Boren fell. They could never fully recover from that disastrous first rotation but did come within two tenths of second by the end. Denver came out strong in round three, putting forth a better performance than it did in round two. 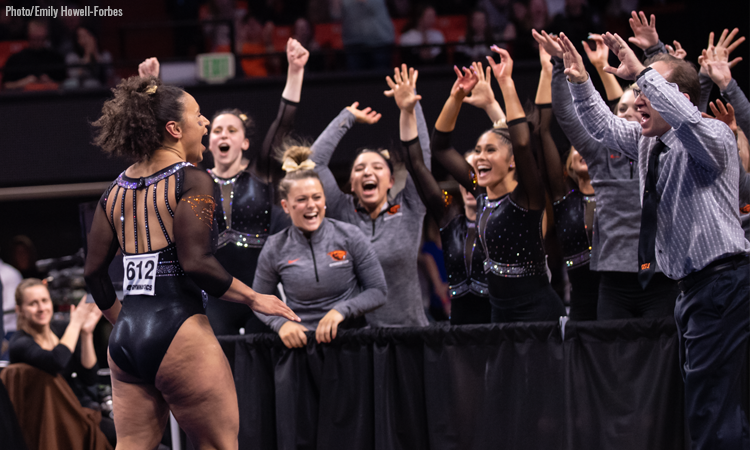 Oregon State had a good showing too, building off of a successful round one in its home arena and clinching a spot at the national championships. Individual Insights: With Florida not advancing as a team to nationals, many of its gymnasts will qualify as individuals. This means that fan favorites like Utah State’s Madison Ward-Sessions of Utah State, who scored a 9.925 on floor, and Stanford’s Kyla Bryant in the all around won’t make nationals like would have without the huge upset. Don’t Forget Us: Washington kept the pressure on Boise State in round two, finishing only three tenths behind the Broncos after a difficult and tightly-scored bars rotation. Junior Madison Copiak couldn’t finish her bars routine after a scary fall onto her back but returned in the next rotation to finish her season strong with a 9.850 on beam. Stanford also had a great day, scoring its fourth 196 of the season. Records: Denver’s 49.450 on bars in round three marks its highest score on the event at regionals. In round two, Denver’s 49.475 on beam is a new record for the team at regionals. It is also the first time Denver has won a regional championship. Isis Lowery’s 9.900 on beam and Sabrina Gill’s 9.925 on bars in round two are also personal bests. Controversies: There was an exorbitant amount of ties, and therefore tie-breaks, that resulted in a chunk of individuals not qualifying to nationals despite someone with their same score making the trip, including Boise State’s Alex Esmerian and Alaska’s Sophia Hyderally on beam, who both had 9.900s to tie Florida’s Alyssa Baumann but lost the tie break due to lower four-judge averages. What’s Next: Denver and Oregon State will compete in semifinal two at nationals against Athens qualifiers Oklahoma and Georgia. Denver will start on beam while Oregon State will begin its meet on floor. Thanks for this recap since I missed a lot of the regionals (I can’t do multiple screens lol). 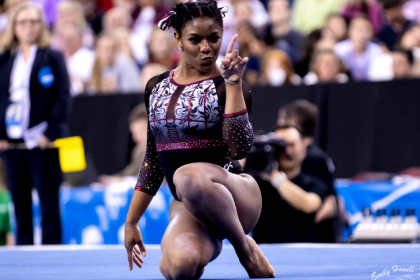 I was watching the Athens regional and Khazia Hislop was really underscored on beam, probably belongs in your controversies section. IMO her routine was as good as Vega’s, who won the event. Thanks again for your coverage!